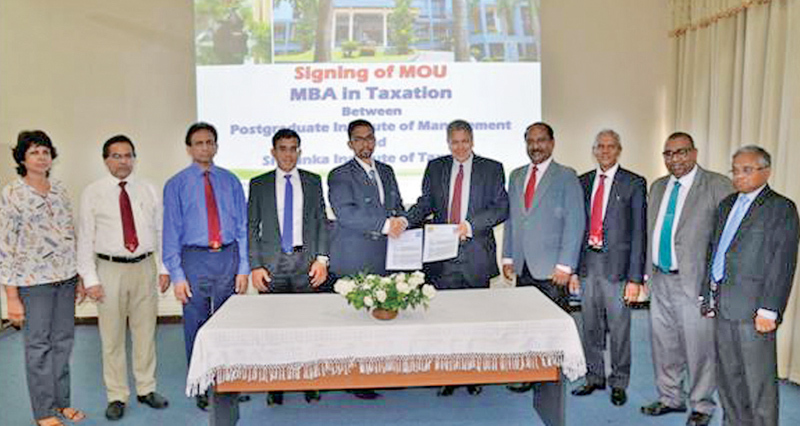 The Postgraduate Institute of Management signed an MoU with the Sri Lanka Institute of Taxation (SLIT) recently facilitating the members of the SLIT to follow the MBA in Taxation (MBA-T) programme conducted by the PIM. This programme will be customized to suit the Tax Consultants and will be different to other programmes offered by the PIM thus far. In fact, this is the first time the PIM has availed of this programme to the public, through the SLIT, which is the National Body for tax education. Taxation has become one of the key arms for the government to enhance its coffers, and therefore, seeking the assistance of the PIM would stand in good stead for the SLIT in implementing the recently introduced measures to increase tax revenue as well as creating a tax-compliance society in the country. In this respect the two key institutions the PIM and SLIT joining hands to raise revenue for the state is, indeed, a historical event. An effective management system and structure are essential fore-runners to producing quality Tax Advisors and Tax Consultants. In this endeavour the intervention of the PIM through its tailor-made MBA-T programme would ensure the required managerial skills are instilled in the sphere of taxation. According to the newly structure programme the candidates while mastering in the desired technical and theoretical inputs, will also gain practical experience by undertaking a comprehensive project at the end of the programme.